Google is readying “the biggest release of Android” in the company’s history. Elements of the new version were showcased overnight during Google’s I/O conference in San Francisco. Executives referred to the upcoming software as “the L series of Android”, and it will control your car, your television and your smartwatch with ease. More than 1 billion people use the Android platform globally, said Sundar Pichai, the senior VP of Android. Pichai said Google is now targeting the next 5 billion people as the company readies “the biggest release of Android” in its history. Perhaps the most radical experience derives from how the new version of Android will work in cars. 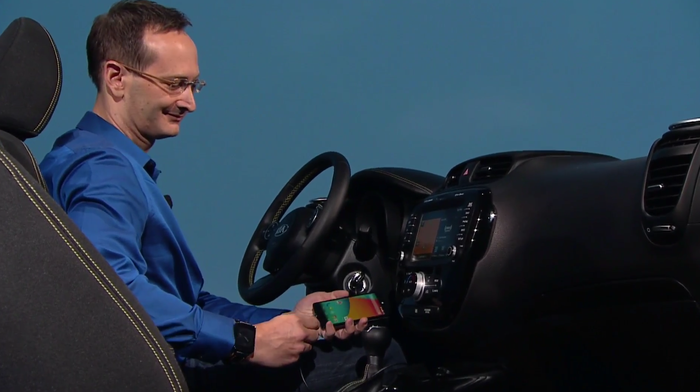 Plugging an L-series Android smartphone casts Android Auto to the car’s screen. Controlling the interface is handled by the buttons found on the car’s steering wheel or through voice prompts, said Patrick Brady, an Android director of engineering. 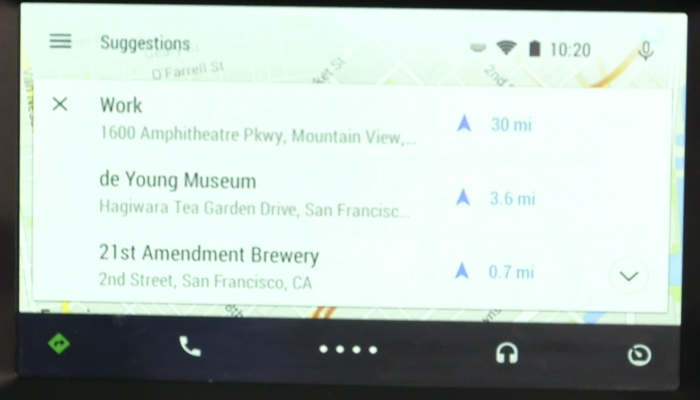 Brady showcased how Android Auto uses contextual information to streamline GPS navigation. Google’s Voice search is used identify nearby destinations and then displays them on a version of Google Maps designed for a centre console. Navigating to popular destinations can be done without entering an address. “Android Auto is completely voice enabled so you can keep your hands on the wheel and your eyes on the road,” said Brady. Messages can be dictated to Android Auto, and to ensure eyes are not averted from the road, the display stays on the Voice Search screen. Android Auto will recite the text message and asks for confirmation before it sends. The L series of Android will integrate just as seamlessly with a living room’s television. Dave Burke, Android director of engineering, compared the current television landscape to the fragmented mobile landscape of 2006, and said it presented an opportunity for Google to unify the ecosystem. 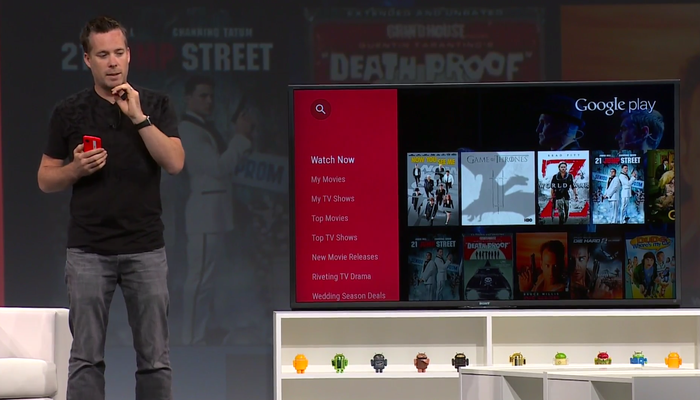 The L series of Android will support an Android TV application. Pressing the home button will overlay an interface rich in movies, app and games. Google’s Voice Search is used to curate content, generate relevant information and perform internet searches, such as “show me Oscar nominated movies from 2002”. 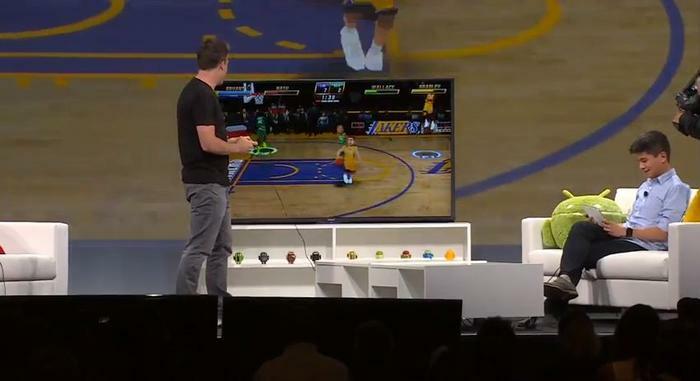 Android TV will help Google strengthen its gaming offering. Gamers can verse each other in a multiplayer mode across different Android devices. During his demonstration, Burke used a television to verse someone who was gaming on a Samsung tablet. Content displayed on Android L smartphones can be cast easily to TVs that support Android TV. Android TV “is ideal for multiple device types, everything from TVs, cable set-top boxes and gaming consoles”, added Burke. Sony’s UHD and Full HD televisions, including televisions from Phillips and Sharp, will operate on Android TV in 2015. 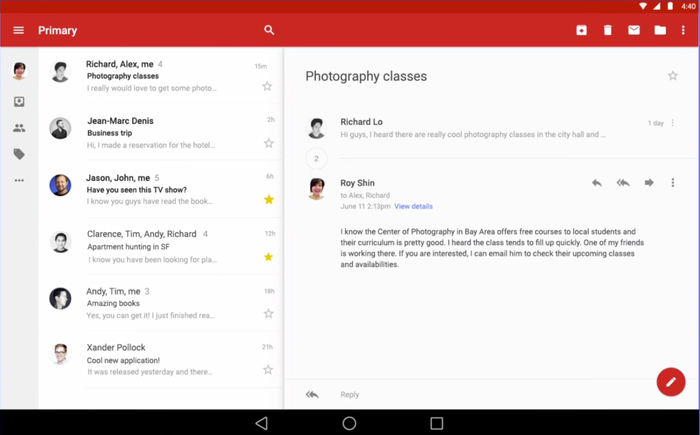 The cursory glance into Android L revealed an update to the design of the software. Notifications now float on the lock screen and the traditional on-screen buttons are now shapes: a triangle for back, a circle for home and a square for sub-menu. Elements on the home screen now have shadows based on ‘virtual light’ sources, said Matius Duarte, the vice president of design at Google. The new design language is known as ‘material design’. “We challenged ourselves to create a design that was not just for Android phones and tablets, but for mobile desktops and beyond,” Duarte said, adding the new design translates well across smartphones, smartwatches, tablets, cars and TVs. 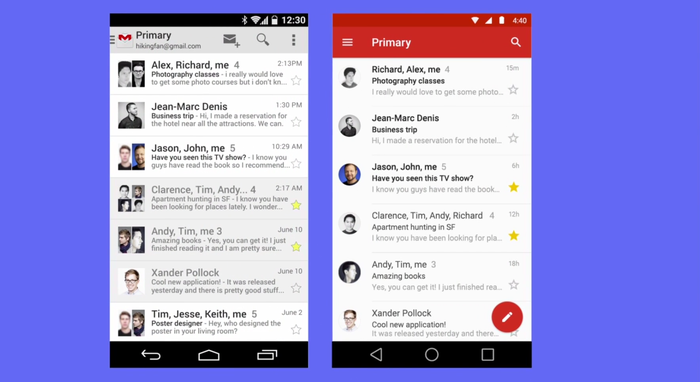 Google’s revised Gmail app was used as an example to showcase the changes in Android L. A focus on transitions and animations earned a mention. 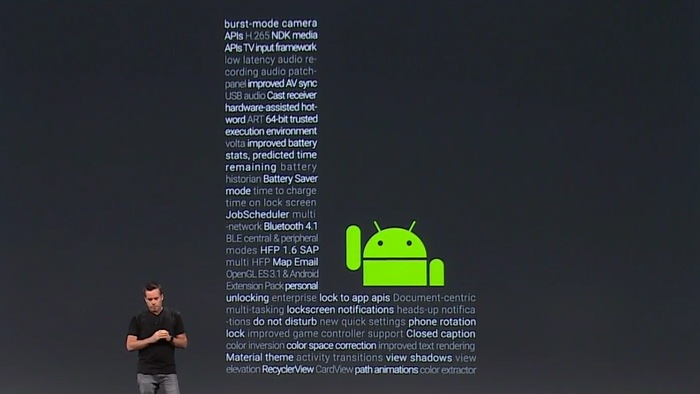 Android L has been optimised to work with Google’s smartwatch operating system, Android Wear. Android director of engineering, David Singleton, showcased the functionality of Android Wear smartwatches at the Google I/O conference using the square-faced LG G watch and the round-faced Motorola Moto 360. "We're right at the beginning of a new phase in the miniaturisation of technology," said Singleton. Singleton dictated calendar entries and notes to his smartwatch and automatically had them synchronised with his smartphone. Wear allowed him to reject incoming phone calls and respond with predefined text messages. Google has unified its Android platform so that it works in complete synchronicity between its smartwatches and smartphones. 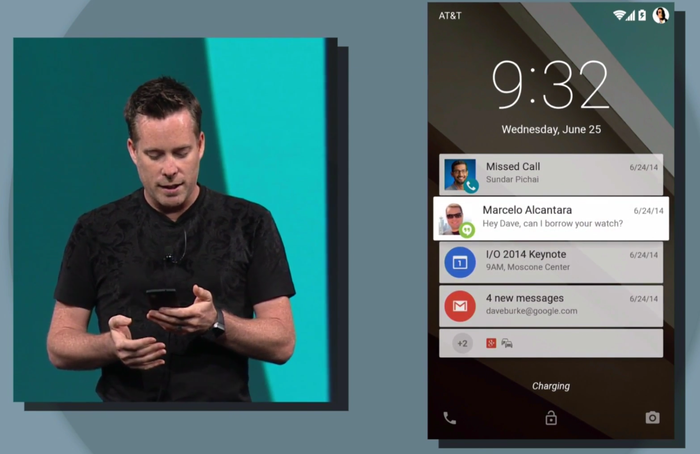 Android L smartphones use connected smartwatches to recognise when the phone owner is present. When in range, the smartphone’s security lock is disabled. It is reactivated only when the smartwatch is no longer in range. Notifications on Wear smartwatches are presented as tiles arranged according to your location, the time of day and events listed in your calendar. Navigating the interface is a matter of swiping, while searches can be dictated. Android Wear smartwatches can also be used as remotes to control compatible Android televisions, following the announcement Google is working with Sony, Philips and Sharp on extending its Android platform to televisions. 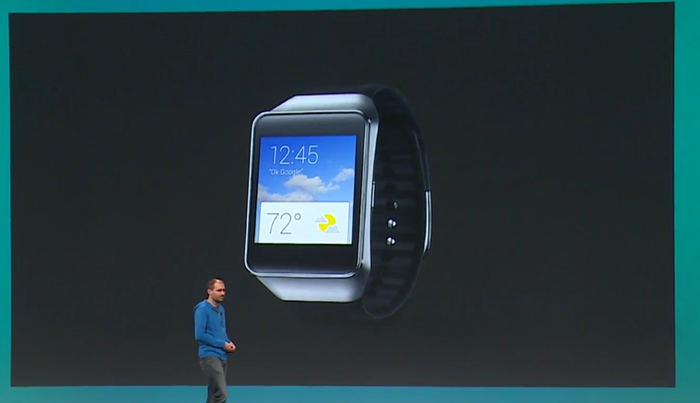 Leading smartwatch manufacturer Samsung will release an Android Wear smartwatch called the Gear Live. It joins the company’s existing range of Tizen Gear smartwatches.